We’re pleased to share the latest published review available on Learning List: Scientific Minds Middle School Science Starters. The subject includes 120 web-based modules that teach important middle school science concepts. The Starters can be teacher-guided for whole-class instruction or played as a video for independent student study. Each module includes interactive vocabulary flashcards and a digital quiz. Lessons are aligned to the Texas Essential Knowledge and Skills (TEKS) standards and are an effective tool for review, remediation, and enrichment. All lessons are designed to improved science comprehension and test scores. Each lesson contains manageable “chunks” of content that are presented with vivid visual elements accompanied by short blocks of text. The highly visual program provides strong support for struggling readers, English language learners (ELLs), and Response to Intervention (RtI) students. Existing subscribers can access the review at the Learning List site. 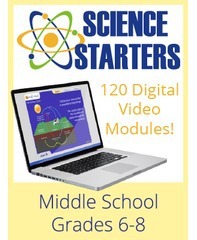 For a brief video description of Middle School Science Starters, click here. If you’re interested in subscribing, you can schedule a webinar here. What’s next? Stay tuned for more reviews to be released in early June.